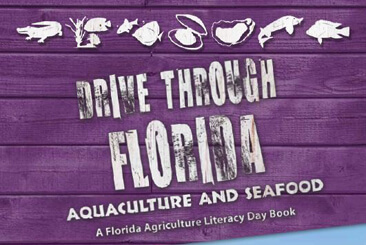 Florida’s aquaculture and seafood will be highlighted in a new children’s book to celebrate the 14th annual Agriculture Literacy Day on May 2. The book, Drive through Florida: Aquaculture and Seafood, features the animated red truck named “Ole Red” and his new friend “Bobby Boat” that takes students on a tour in and around Florida to learn about aquaculture and seafood farms. Florida volunteers are invited to read in elementary classrooms around the state as part of the event. The book is geared to students in kindergarten through fifth grade. Readers are asked to schedule their classroom visits first, and then order materials on the Florida Agriculture in the Classroom’s (FAITC) website at www.agtag.org. Materials will be mailed to readers. Early readers will receive one book, teacher and volunteer flyers and one set of stickers and bookmarks per classroom, which they can be delivered to the classroom the day of the reading. Please allow two weeks for shipments. The deadline to register for materials is Tuesday, April 18. Readers are encouraged to read on Agriculture Literacy Day, but can read until end of school year. The book and materials are provided free of charge, thanks to funding FAITC receives from sales of the agriculture specialty license plate, “Ag Tag,” and donations from the Florida Farm Bureau Women’s Committee. Florida Agriculture in the Classroom is a non-profit organization that educates Florida teachers and students about where their food, fiber and fuel comes from using lessons, materials, grants and other programs like Florida Agriculture Literacy Day. For more information, contact Becky Sponholtz at 352-846-1391 or email sponholtz@ufl.edu.